Acrylic pegboards or drying racks are fabricated from sheet stock of either 3/4" (19mm) or 1" (25mm) thick clear acrylic or more commonly known, Plexiglas material. Acrylic Pegboards are typically provided clear to allow full view through the units or the pegboards may be supplied with a frosted back-side to screen or reduce overhead glare or reflected light. All edges of the drying racks have a slightly chamfered, beveled eased edge and flame polished for a clean, safe and aesthetically pleasing product. Standard sizes as indicated below are available along with custom shapes and sizes. Plexiglas acrylic material offers excellent resistance to most chemicals, including inorganic alkali and acid solutions. 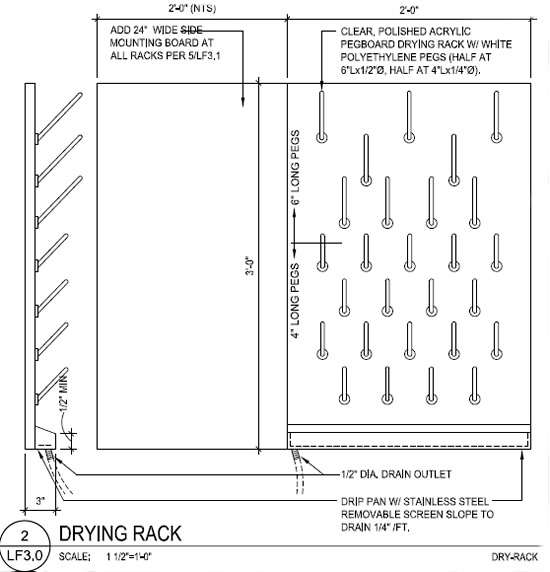 Drying racks made of Acrylic resin are supplied with white or black 2-prong PP Polypropylene pegs and in three different lengths of 5.5" (140 mm); 6.5" (165 mm) and 8" (200 mm) x 3/8" (9.5mm) Diameter. Black or white PP Pegs 6.5" - two prong are industry standard and in stock. Pegboards are available with or without a drain trough although under mount stainless steel drip trays or troughs are highly recommended. 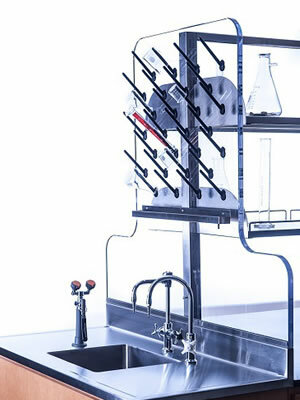 All acrylic pegboard drying racks include PP pegs, necessary mounting hardware and drainage tubing. 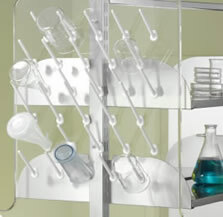 Protect expensive glassware, beakers, bottles, test tubes and promote lab safety with a high-quality Acrylic lab pegboard. 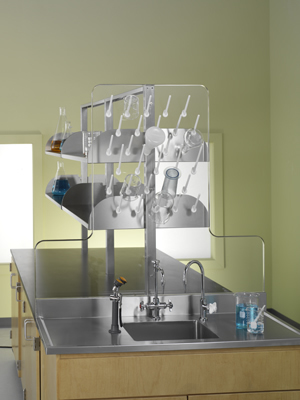 A complete line of accessories is available to customize your lab setting with soap and paper towel dispensers, glove boxes, flask holders or drain baskets may also be added to any Acrylic pegboard / drying rack. 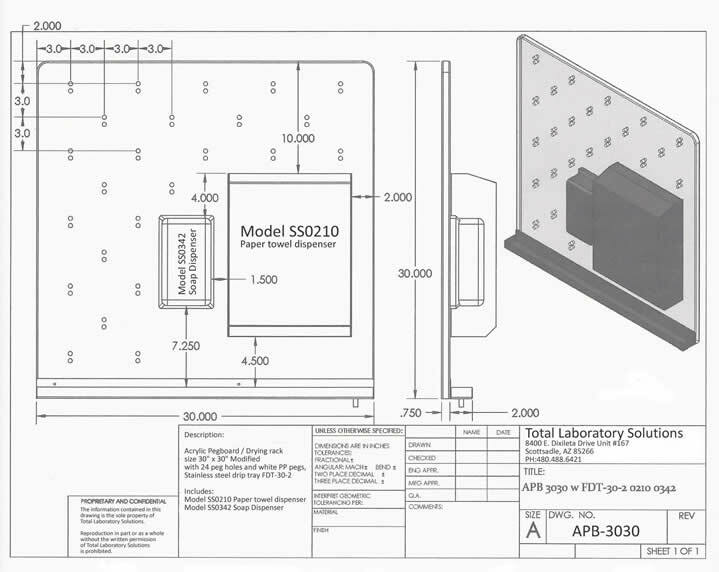 The quantity of PP Pegs will be modified to accommodate the dispensers or stainless steel accessory products. See below rendering for an example. Standard size pegboards or splash guards are typ[ically available within 7-10 days or sooner from order date. Acrylic is easily scratched and cracked and will yellow in time if not maintained properly. To ensure that your acrylic products look as beautiful as the day you received them, please use only clear water and a soft cloth for cleaning. Do not allow any chemicals to come into contact with the acrylic, as it will cause certain damage. Do not use cleaning fluids, sprays, Windex or soap. Only use clear water for cleaning. Caution: Incorrect installation will result in cracking of the acrylic. In the event of field-drilling the acrylic, remember to CAREFULLY drill and tap the holes using machine screws only. DO NOT OVER TIGHTEN. Upon receipt of your order, please take care to inspect the product(s) to be sure they have been made to order and there has been no damage during shipping. If there is damage, it must be reported immediately and pictures taken. 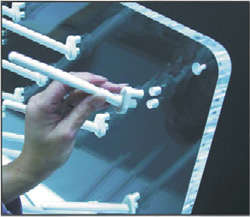 We do not offer an extended warranty on acrylic products beyond the day the products are received and inspected.